Agente 077 missione Bloody Mary movie poster . 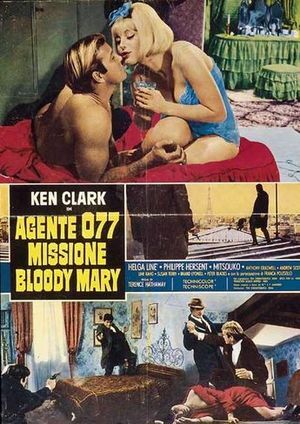 The first Euro-spy of 3 that Ken Clark as Agent 077 starred in the 60's. Mission Bloody Mary is the search and destroy mission to retrieve a Nuclear Bomb from a radical crime syndicate called the Black Lily. The European answer to the Bond films in the 60s makes this title a must see for spy enthusiasts, cool gadgets, beautiful women, exotic locations, with smart criminal masterminds, WOW! Registration N776TW, c/n 18408/326 built in 1962. At Aéroport de Paris-Orly. In 1969, this aircraft would be involved in TWA Flight 840, during which it was hijacked and its nose was destroyed. Rebuilt, the aircraft has had a second life as N28714. Reg. N776TW Boeing 707-331B of TWA-Trans World Airlines. This page was last modified on 24 February 2019, at 07:59.